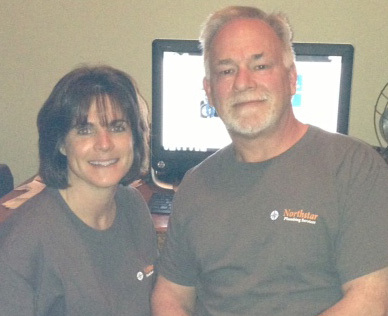 My name is Brian Betters, my wife Kim and I are the owners of Northstar Plumbing Services. Before relocating to our new home in Davidson, North Carolina my family and I lived in a small town in Maine. While living in Maine, I graduated from Southern Maine Community College's plumbing program earning my journeyman's license. After graduation I went to work for one of the largest plumbing and heating companies in southern Maine and it was there that I truly learned the trade and earned my masters license. Although we loved Maine, we longed for a similar lifestyle but with a much shorter and warmer winter. After doing some research and visiting North Carolina, we fell in love with the Lake Norman area and as they say, the rest is history! Northstar Plumbing Services is a small family owned business specializing in residential service, repair, and replacement. We offer quality service at reasonable rates and pride ourselves in treating your homes as if it were our own. From fixing that dripping faucet, to replacing a leaking water heater, you can be sure that all work will be performed in a professional manor while meeting all state and local codes. We realize that our success depends on your satisfaction. We will offer the best solution to your individual plumbing needs and never try to sell you something you don't need or want. If it can be repaired, I will repair it but if your money is better spent with a replacement, I will give you that option. With Northstar, it is truly all about the customer. We look forward to the opportunity to provide you with quality service at reasonable rates.